In a previous article about quilting fabric I briefly mentioned batting, but in this article, I’m going to talk about how to choose the right batting. It’s important to choose the right kind of batting, many new quilters don’t realize the importance, or know there are many different kinds of batting. Now, as I said previously, batting is the “sandwich filling” of a quilt, the bit that goes in the middle between your pieced quit top and the back. It’s also the part that creates the warmth, insulation and weight of your quilt. The quilt sandwich is usually pinned round the edges, or special clips can be used to secure the sandwich temporarily, Wonder Clips are very popular. Once the sandwich is secured it is then sewn together, this can be done by hand or with a sewing machine designed for quilting. There are many different ways of doing this, free motion, stitch in the ditch, tieing etc which I won’t go into here. Just make sure you do a good job whatever method you use. After all your hard work you don’t want your “sandwich” to fall apart after a few uses! Choosing the right batting can also affect the finished look of your quilt and also mean the difference between a successful or unsuccessful project. Why spend days or weeks on your design, piecing etc. and then use any old batting in the sandwich, that makes no sense to me! Take some time to research and learn about the best batting for you project. As you can see, batting is available in several different types of fiber. Polyester tends to stand up to repeated washing while retaining the high loft. It tends to be better for people with allergies being mostly hypo-allergenic. It’s also suitable for machine or hand quilting. Cotton has a lower loft, but is generally more popular because it’s made of natural fibers. This means it’s a “breathing” fabric which lets you stay cooler in the summer, but also keeping you warm in winter. Because cotton batting tends to clump it’s better for machine quilting, not hand tying. Wool batting is like cotton in that it “breathes”, but is more suited to hand tying. It’s manufactured in 2 different ways, needle punched and bonded. If you need your quilt to stand up to hard use then needle punched batting is best. Thousands of needles are used in piercing and interlocking the fabric, this results in a much firmer and heavier batting than a bonded one. Bonded wool batting is where the layers are glued together with a special bonding agent. It’s cheaper and fine for light use, but I wouldn’t use it on anything that’s going to get a lot of use. 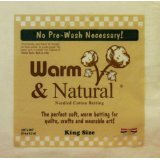 My preferred quilt batting is cotton (like many other quilters!) with it’s softness and warmth. You can buy your batting in any quantity, obviously, as is usually the case, bulk buying is more cost effective. 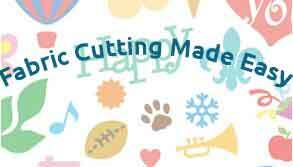 You can buy it precut to a size of you choosing, or rolled on a tube for larger quantities which you cut to size yourself. Sometimes it’s easier to buy your batting pre-cut, specifying single, queen, full etc. Shop around for the best prices and look for special offers on bulk buys. Because Amazon now stocks products from other companies you’ll find lots of bargains there. I quite often find bulk bargains on Ebay too. If you’re lucky enough to have a local quilting store then its always a good idea to support a local business. Unfortunately, I don’t have a quilt store near to me so most of my quilting notions and tools are purchased on-line. Finally, take a bit of time learning about batting, it’s just as important to the finished result of your quilt as all the work that goes into it. I read this post in the nick of time. I just bought a new (second hand) sewing machine after my old one gave up the ghost, so now I’m thinking of getting round to finally doing some quilting. You made a comment in the post about why anyone would use any old thing for batting, and I am glad you said that because I probably would have! The reason is purely money saving. However, I take the point that if you are creating something beautiful that you are going to take time and care over then why spoil it with inadequate batting inside? I am thinking of quilting up some fabric which I then cut and make up a waistcoat. Do you think this is too complicated a project for a beginner quilter (but an experienced sewer)? This project appealed to me because I feel the cold and the thought of a warm, quilted waistcoat to put on this winter was an attractive one. Perhaps polyester batting to stand up to repeated washing….what do you think? Hi Annie, lovely to hear from you again and great to hear you’re going to do some quilting. If you’re an experienced sewer then this sounds like the perfect project for you, just have a think about how you’ll finish off the seams to keep it neat. Once you have the waistcoat cut out, you could go round all the edges with bias binding before you join, then the seams inside would match the edges. Probably a light polyester batting would suit this project. Which sewing machine did you get btw? Yes, bias binding sounds like it could be a good way to go. I hadn’t really thought it through, but the seams will be quite thick I suppose and probably won’t want to press out flat. I might do a trial piece with a French seam and see if that works, that way all the fabric and batting would be fully enclosed. But bias could be better. Hmmm….. work in progress. I searched my local classifieds (Leboncoin in France is brilliant), and not far from me a lady was selling a Husqvarna Viking, not the top of the range Husqvarna but seemed from the reviews to be a solid basic machine. It does come with quite a few accessories including a patchwork foot and guide bar for neat parallel lines. The young lady was not a sewer, just bought it to do a pair of curtains, decided she isn’t into sewing and promptly advertised it, so it has had very little use. I just made a blouse, which turned out well so I am pleased. The Husqvarna Viking is a great solid machine. I have one that is in getting repaired as I type, it got stuck on reverse. The stitches are SO neat, a good buy! A french seam could work, I haven’t made a quilted jacket before but keeping the seams flat sounds like a good idea. Let me know how you get on with it. I’d love to see a photo of the completed garment, maybe do a short article on how you made it? I’m really happy with the machine so far, though I haven’t investigated doing button holes or some of the other features. As for the waistcoat, I’ll keep you posted. I’ll find out what works then see if I can get you a photo when it’s done, and I could write a bit about it, with pleasure.